The Story Project encourages local residents to share personal stories of overcoming or surviving harmful outcomes associated with alcohol or other drug use, at whatever level of anonymity, so young people in our communities can be better informed as they make their early and consequential choices. Is there a story in you? CADY is inviting local residents of any age who have a story to tell around alcohol abuse or other drug use that might encourage a young person hearing the story to never start down such a path. Many of us have lived through experiences that involve the negative impact of alcohol and other drug use or have someone close to us who has. Whether it’s a story of growing up in an alcoholic home, experimenting with a drug that turned into a habit, or a powerful story of recovering from dependency on drugs or alcohol, we hope that community members consider sharing the story to help prevent negative outcomes in our youth today. Often times in the sharing of difficult stories, a burden is lifted, and knowing that sharing your story may prevent a similar experience in another young person’s life can be fulfilling as well. Our youth need to hear our voices to use our experiences in their decision-making. They get so many other messages from music, videos and television, that having the balancing voice of our experiences will help them make more informed decisions. Real People. Real Stories. Changing Lives. To send us your story, you can email us. A 22 year old female “Alison” veteran of the war in Afghanistan, returned home to Grafton County after military service with acute onset of a serious psychotic disorder, schizophrenia, with no insight into her mental illness. Alison also abused marijuana, which in turn, worsened her psychotic symptoms and put her at greater risk for involvement in the criminal justice system. Alison was arrested on Class A misdemeanor level charges of Simple Assault (of an officer) and resisting arrest. Alison had gone off the road and gotten stuck in a snow bank. Alison, un-medicated, was too disorganized and agitated to identify what steps she would need to take to get out of the snow bank. She decided to smoke marijuana which increased her paranoia, flashbacks, delusions, and hallucinations. The police were called because there had been some break in’s in the area and the neighbors thought that someone was “casing” one of the houses. When the police arrived Alison flashed back to Afghanistan and believed that they were a threat to her. She became belligerent and was unable to understand why they were there to arrest her. Alison was ultimately arrested. Alison was referred to the ASSERT MHC by her attorney and went through the ASSERT application process, including a full mental health evaluation and criminal background check and was deemed eligible to participate in ASSERT. Alison decided to sign a contract and enter the Program, agreeing to receive mental health treatment for at least one year and be monitored by the 2nd Circuit Court, District Division, Littleton and the ASSERT Team. Alison received weekly individual therapy, case management, drug testing, employment services, court monitoring, psychiatry, medication monitoring, family support, on a monthly basis, and veteran services through the VA in White River Junction. The VA worked closely with the ASSERT Team to help build a system of support and resources for Alison. Alison set her own personal goals (weight loss and exercise program, writing, repairing relationships within her family) and also followed through on her Individual Treatment Plan goals, meeting the expectations of the ASSERT Program. The ASSERT Program served as a gateway to treatment for Alison. About nine months in to the ASSERT Program, Alison began feeling increased paranoia and experienced side effects from her medications. The paranoia triggered delusional thoughts and convinced her that it would be better if she didn’t take her medication. She stopped her medications. After several weeks of not taking her medication she was able to disclose the information to her case manager and discuss her decision. She was able to get support to talk about her concerns with her psychiatrist and got back on her medications that day. Allison’s family was part of the discussion around her medication. She talked about this decision with her case manager after she stopped her medication, and also decided to get right back to her medication regiment after she realized that this did not actually help her. Near completion of the Program, Alison moved into her own apartment and out of her parent’s home. She gained employment, which she could not initially maintain due to the level of impairment from the symptoms of her mental illness. Throughout her involvement in mental health court Alison was supported with her addiction to marijuana. She was able to gain knowledge about her illness and the impact substances have on the symptoms of her illness. Alison was able to identify that she was going to smoke marijuana when she graduated. Alison did just that for the first week after graduation. Alison called her case manager and reported that the marijuana made her feel ill. She asked to continue her treatment and also asked to continue with drug testing until she could be sure she would not use marijuana again. Alison does not use drug testing with her therapy any longer and has maintained sobriety and continues with therapy. She states that she is able to “stay sober for me now”. Alison maintains mental health treatment although not required through the court. She still struggles with a severe and persistent mental illness on a daily basis. Alison, with support is able to have a more stable, healthy, and successful life. “This is a very compelling story written by a father in 2006 about the loss of his son. Dr. Goldner is an obstetrician in southern NH. I spoke with him in 2006 and he provided CADY with his story, along with a stack of color copies, to use in our outreach work.” —Deb Naro. 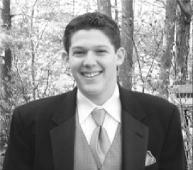 In the early hours of October 9, 2005 on a small two-lane road in Connecticut during a torrential rainstorm, my nineteen-year-old son Jason died in a single car accident. The police contacted my older son’s school officials who then informed him and drove him to our hotel where my wife, Laura and I were staying for parents’ weekend. He called us from the lobby and asked us to come down. As I exited the elevator the look of terror on Evan’s face told an immediate story. The school’s Vice-Chancellor proceeded to inform me of Jason’s death. The pain was insufferable as we started our unexpected journey. We changed our flight plans and returned home to New Hampshire clueless of the travails that faced us. Early the next morning we drove to Farmington, Connecticut where we were met by family members and traveled to the coroner’s office to see Jason. The shock of seeing my son, cold and still as though sleeping on the couch was unbearable. I touched his face hoping his eyes would open one more time. We walked out, gained our strength and proceeded to the scene of the accident where we saw the tree that took our son’s life and hastily picked up pieces of his car and personal belongings strewn around the crash site. Proceeding to the state police barracks we were greeted by a compassionate officer who handed us an inven- toried box with our son’s things including his school books and CDs. Through a padlocked fence we were shown our son’s blue Subaru. Unsatisfied with such a distant view, we hiked around into the woods behind the building and took numerous pictures. 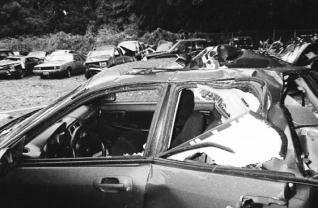 The probable events of the crash began to play out in my mind as it has thousands of times since. The image of my son’s last seconds as his head hit a small piece of metal instantly ending his short life. We traveled next to Jason’s apartment in Rhode Island. Entering in eerie silence we looked on a life in motion now abruptly stopped. Pots soaking, books open and to do lists all awaiting his return. Through our tears we took some of Jason’s possessions and journeyed home with an incredible sorrow I could never have imagined. When I first heard about the accident I assumed the cause was weather and speed. I was certain my children did not drive intoxicated. They promised. Slowly, Jason’s friends opened up and confessed that they often drank and drove and that Jason considered himself a better driver drunk than any sober driver. They were betting on what he would “blow” – what his blood alcohol content would be. I refused to accept these stories until toxicology reported Jason’s blood alco- hol level at 0.2%, two and a half times the legal adult limit and ten times the juvenile limit. The code of silence amongst these teenagers, their perceived immor- tality and the ready availability of alcohol combined to end my son’s life. Our children, unwary passengers and innocent bystanders are being killed and maimed. The pain and suffering is enormous. Education and raising the legal drinking age has unmistakably not worked. We must think outside the box using comprehensive, inventive education, innovative technology and “drinker’s-ed” licensing for teenagers. The laws must be concise and applied uniformly to all social, economic and ethnic groups. The punishment must fit the crime and be severe enough to deter risk. Our family will hurt for the rest of our lives. I am thankful that no one else was permanently injured or killed by our son’s poor decisions and plead that his death and those of other young adults rally a cry to change the culture. Go to your children, hug them, look them in the eye and ask them if they now or have ever drank and drove. When they say no ask again and again and again. Then tell them you love them, that you dread the thought of losing them and would be betrayed if they were dishonest. Please feel free to spread this statement around as one parent’s attempt to stop this senseless loss of our youth.